Seattle transportation planners have abandoned plans for bike lanes on 35th Avenue Northeast that divided the neighborhood and led to mediation in an attempt to resolve the dispute. Supporters and opponents of the project who were involved in closed-door talks over the street redesign were notified of the decision Tuesday, said Seattle Department of Transportation (SDOT) spokesman Ethan Bergerson, though an update on the project’s webpage was posted Friday. Under the new redesign, the street will have one vehicle travel lane in each direction, a center turn lane for part of the corridor and parking only on the east side of the street between Northeast 47th and Northeast 85th. No bike lanes will be added. Since 2016, SDOT has been planning to repave and reconfigure the road between Northeast 47th and Northeast 89th streets. The agency started with outreach to collect data and understand how the street is used. Those efforts extended through 2017 and included door-to-door communication, sending direct mailers and holding open-house meetings. Before the redesign, the street had one northbound and one southbound travel lane, peak-hour restricted parking on each side of the street for most of the corridor, and a shared turn lane between Northeast 84th and Northeast 89th streets. SDOT had planned for one travel lane in each direction and parking only on the east side for most of the street to make room for bike lanes, which would be protected by a three-foot buffer in some stretches. “There wasn’t a way to fit in bike lanes on 35th without creating conflict points,” Bergerson said. 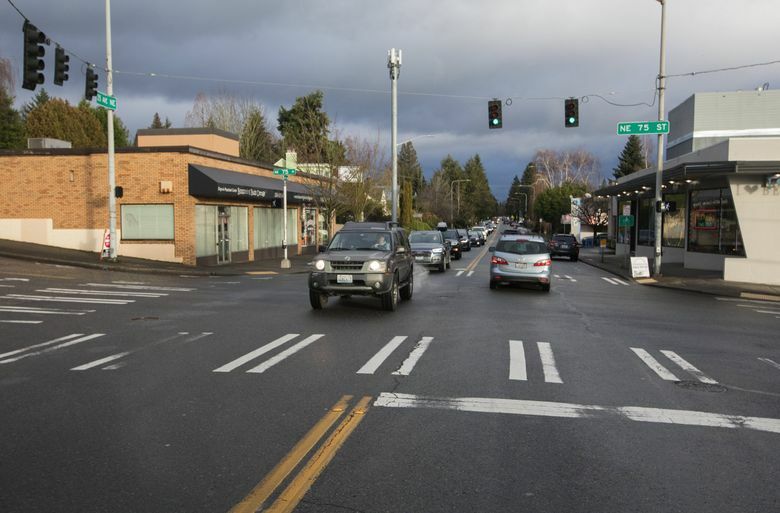 Instead, SDOT will add signage and crosswalk improvements on 39th Avenue Northeast, a parallel neighborhood greenway four blocks away that can be used by bicyclists. “This outcome is a blow to anyone who engages genuinely during the city’s design process. It shows that the desires of a small minority in the neighborhood was to stop the bike lane – at any cost,” said a statement from Safe 35th, a group of bike-lane supporters who participated in mediation. “Improvements to the 39th Avenue greenway in no way equate to a safe, designated bike lane on our busy neighborhood arterial,” the statement added. Funded by the $930 million Move Seattle levy that voters approved in November 2015, the work is part of SDOT’s efforts to improve street safety and make roads accessible to different kinds of users. The project will cost up to $7.9 million. The street-redesign plans created fierce community debate over which road users to prioritize. While both sides agreed on the need to improve safety in the corridor, which has been flagged for fast and aggressive drivers, they differed on how to get there. Bike-lane supporters pointed to the city’s Bicycle Master Plan, approved by City Council in 2014, that recommended bike lanes on the avenue. Opponents of the lanes, including business owners, worried about reducing parking to make room for bicyclists. Some critics also complained that the city was prioritizing cyclists over drivers, and felt ignored in the planning process. Amid tensions over the project last year, departing Councilmember Rob Johnson, whose District 4 includes the neighborhood, reported receiving threats, detectives found fireworks in construction equipment and vandals damaged equipment used to measure speed and traffic volume in the area. Project opponents denounced the alleged threats and vandalism, and said they had nothing to do with such actions. Mayor Jenny Durkan last fall recruited representatives from groups supporting and opposing the project to participate in the mediation, at a cost of $14,000 paid from the city’s bicycle facilities budget. However, the mediation, which ended Tuesday, didn’t produce a consensus, Bergerson said. SDOT then reviewed concerns from both sides and decided to remove bike lanes from the project.